SQL SERVER – Fix – Error – 11537 – EXECUTE statement failed because its WITH RESULT SETS clause specified column(s) for result set number, but the statement sent column(s) at run time. 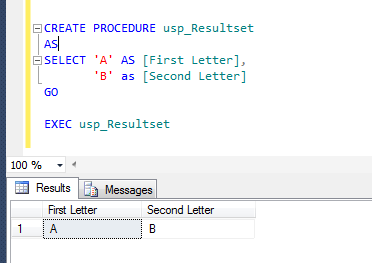 EXECUTE statement failed because its WITH RESULT SETS clause specified %d column(s) for result set number %d, but the statement sent %d column(s) at run time is one of the new error messages seen in SQL Server 2012. This error message is due to the invalid use of new feature EXEC WITH RESULT SETS. Error Message: EXECUTE statement failed because its WITH RESULT SETS clause specified %d column(s) for result set number %d, but the statement sent %d column(s) at run time. Let me create a sample stored procedure to generate this error. 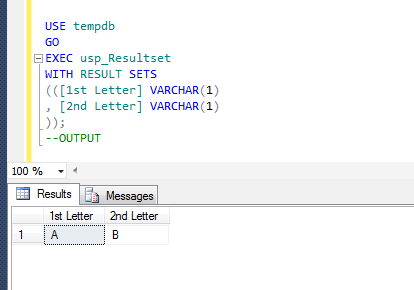 You can see that the above stored procedure is executed successfully and it has ONE result sets with TWO columns. Lets try to execute it using WITH RESULT SETS clause. EXECUTE statement failed because its WITH RESULT SETS clause specified 1 column(s) for result set number 1, but the statement sent 2 column(s) at run time. Ooops…… I am unable to execute it properly. It returned the error message. Why this error ? Because, the above stored procedure returns ONE result sets with TWO columns but we defined WITH RESULT SETS clause for ONE column ONLY. Lets rewrite the script and define TWO columns in the result sets (the same number of columns in the result sets returned by stored procedure) to avoid this error. 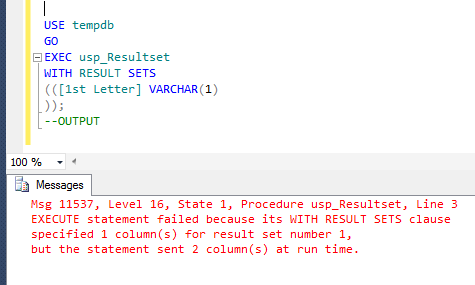 Remember, whenever you use any stored procedure using WITH RESULT SETS clause, make sure you use exactly the same number of columns in result set returned by stored procedure to avoid such errors.